Planning your holiday menu? 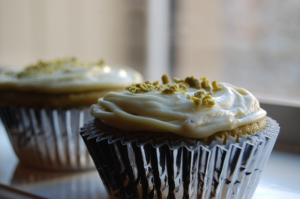 Well, here is one your guests will love for dessert (and if there are any leftovers, for breakfast the next morning…): Greentea White Chocolate Cupcakes, made with our own… wait for it… Greentea White Matcha Chocolate Chupon! Like snow fall on Christmas Day, these cupcakes are perfection. Divide batter evenly into prepared muffin cups. Bake at 325F for 20-23 minutes until a tester comes out clean and the tops spring back when lightly pressed with a fingertip. In a large mixing bowl, cream together cream cheese, butter and melted white macha chocolate. Beat in vanilla and milk, then add in the confectioners’ sugar gradually until the frosting reaches your desired consistency (make it a bit stiffer if you wish to pipe it onto the cupcakes instead of spreading it with a knife). Want to make this recipe? Visit our online store to order your Chupon white matcha chocolate!